Mega Sale! 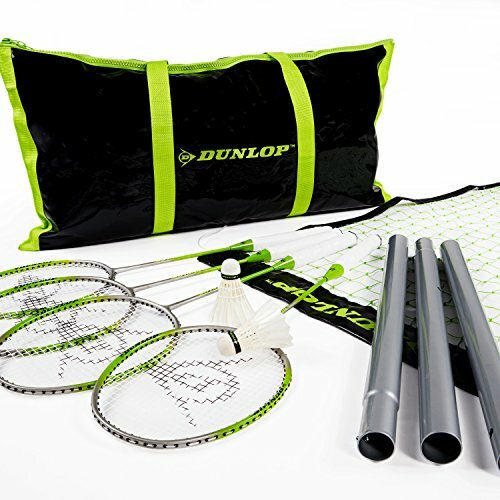 Save 25% on the Dunlop Badminton Outdoor Lawn Game: Classic Backyard Party Sports Set with Carrying Bag by Dunlop at Wander Soul. MPN: NET200_087D. Hurry! Limited time offer. Offer valid only while supplies last. ADJUSTABLE NET - Portable mesh netting measures 21 feet x 2 feet with an easy to assemble slip on design, works for outdoor use, and stands at 5 ft.
- Portable mesh netting measures 21 feet x 2 feet with an easy to assemble slip on design, works for outdoor use, and stands at 5 ft. 1 in. tall, the ideal height for badminton games. This set has it all and is fun for all, wherever you go, bring the party with you, anywhere and anytime! - Complete classic system includes net, poles and setup accessories, 2 shuttlecocks, 4 racquets and boundary rope that all fit inside a carry bag for easy travel and storage. No need to buy other gear or accessories since this set covers everything you might need to have fun. - Fun for kids, teens, adults or families to play at the park, in the yard at a BBQ, while camping or tailgating, in physical education class, or on a traditional court. This set is perfect for all different ages and skill types and is great for travel or a game on the fly; take this set on the go and have a blast! - Designed for instant play, this professional set contains a vinyl and mesh net, 3-piece telescoping aluminum poles with quick adjusting push button locking systemthat are designed for quick construction, meaning you will have more time to play and require less time for setup and teardown. - Looking for a birthday gift for the children or teen in your life? Check out Dunlop’s badminton gear set, ideal for summer play at the park, at camp or even outdoor wedding fun. Don’t miss out, add one to your cart today! Pole Height: 5 ft. 1 in. New Tennis Vibration Dampener - DGT Dang Good Tennis - Set of 6 Flames Different Colors-Great Feel- Shock Absorber Best for Tennis Rackets. Get Yours Now to Unleash Your Best Tennis!